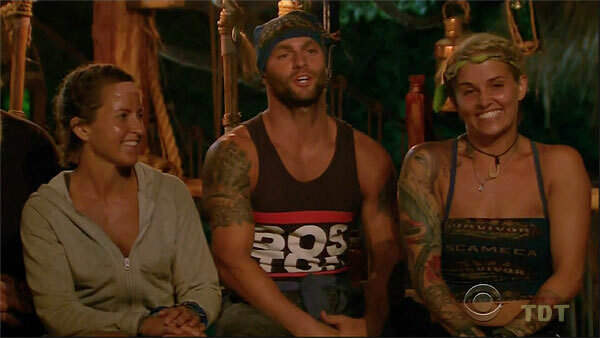 Survivor: Worlds Apart (2015) - 12th place, 7th out. Voted out in Episode 7, "The Line Will Be Drawn Tonight" (Day 19). Worlds Apart Ep. 1 RC/IC: "Ladder Daze" - Performs no solo tasks, but Escameca recovers from an early deficit, doesn't lose (2nd*/3). Worlds Apart Ep. 2 RC/IC: "Basket Case" - Sits out, as Escameca doesn't lose again (2nd/3). Worlds Apart Ep. 3 RC/IC: "Dear Liza" - Helps carry and pour, occasionally runs ahead, and Escameca wins (1st/3). Worlds Apart Ep. 4 RC: "Collar Blind" - Paired with Lindsey, they get a platform dropped on them, and eventually, Blue Collar loses (3rd/3). Worlds Apart Ep. 4 IC: "Houses of the Holey" - After she makes a late drop Rodney swaps in for her, and eventually Blue Collar loses again (3rd/3). Worlds Apart Ep. 5 RC: "Beach Balls" - Now with New Nagarote, makes no catches, and they lose big (5-2). Worlds Apart Ep. 5 IC: "Swing Break" - Paired with Carolyn pulling the sled; Nagarote loses big again. Worlds Apart Ep. 6 RC: "Air Raid" - Hits one target, and Nagarote wins (6-5), goes turtle-watching. Worlds Apart Ep. 6 IC: "Shut Your Trap" - Takes three tries to win the match that Mike is trying to throw, but eventually succeeds, and Nagarote wins. Worlds Apart, Ep.7 IC: "Get A Grip" - Sixth to drop out, fairly early (7th/12). Worlds Apart, Ep. 5: Max Dawson (voted out, 5-2). Worlds Apart, Ep. 7: Four votes, from Jenn, Joe, Hali, and Shirin (idoled out, -4-1, after Jenn played her idol). I was gonna go with Max & Shirin, but no. The merge is coming. Time to go back to Blue Collar, where I belong. Early Ep7. Back at camp: Ha ha, they stole our shelter. Good joke, guys. Nobody will ever guess we're together! Jenn has an idol? Uh oh. Gordon Holmes at XfinityTV - "Kelly - 'I'll Buy My Girlfriend a Nose Job'"
Gordon Holmes at XfinityTV.com: "Kelly - 'That Vote Was Personal'"
Rob Cesternino at RHAP: "Exit Interview With the Latest Player Voted Off Worlds Apart - 4/02/15"
"Personal Claim to Fame: My career because I get to use my pepper spray, handcuffs, night stick and Taser before I even walk out of the house. Inspiration in Life: My Mom- she raised three kids on her own. What is your favorite sport? Watching football and playing racquetball. Reason for Being on Survivor: The million dollars and the adventure of being on Survivor. Why You’ll “Survive” Survivor: I can analyze people and I have a competitive drive. Why Will You Be the Sole Survivor: I am smart, witty and have the drive/need for the $1 million."